RIPng is an extension of RIP for support of IPv6. 1. Enable RIPng using the global configuration command ipv6 router rip tag. The tag is used to differentiate between multiple RIP processes. It does not have to be the same on all routers. 1. Runs over User Datagram Protocol (UDP). 2. Uses the standard port number 521. Routers that use RIPng listen on the multicast address FF02::9 and send their update messages to this address. 1. Successor: A route (or routes) selected as the primary route(s) used to transport packets to reach destination. Note that successor entries are kept in the routing table of the router. 2. Feasible successor: A route (or routes) selected as backup route(s) used to transport packets to reach destination. Note that feasible successor entries are kept in the topology table of a router. There can be up to 6 (six) feasible successors for IOS version 11.0 or later. The default is 4 feasible successors. 3. DUAL (Diffusing Update Algorithm): Enhanced IGRP uses DUAL algorithm to calculate the best route to a destination. Diffusing Update Algorithm used by EIGRP tracks all the routes advertised by neighbors and selects routes based on feasible successors. It inserts lowest cost paths into the routing table (these routes are known as primary routes or successor routes). 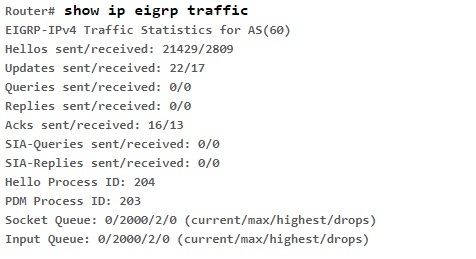 Please note that EIGRP does not summarize received routes. That is, if a network was not summarized at the major network boundary (this may happen, if you use "no auto-summary" command), then all the subnet routes will be carried into the routing tables of subsequent routers in the rest of the world. EIGRP uses multicasts to send queries to neighbor routers. EIGRP Hello packets are multicast to 224.0.0.10. 1. EIGRP has certain features that belong to link-state algorithms (like OSPF) than distance-vector algorithms. 2. Ex: EIGRP sends a partial routing table update, which includes just routes that have been changed, not the full routing table like distance-vector algorithms. 3. The feasible successor route will become the primary route when its advertised distance is higher than the feasible distance of the successor route. The feasible successor is kept in the topology table as a backup route and can be used in the event that the successor route goes down. 4. Support VLSM, route summarization, and routing update authentication". Therefore B is correct. 5. Unlike RIP and IGRP, EIGRP updates are not periodic. EIGRP updates are sent only when there is a topological change in the network. 6. 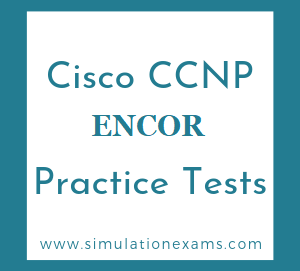 In EIGRP, the router doing the summarization will build a route to null0 for the summarized address. This ensures that the packets that are not destined for any network are routed to null and thus dropped. 7. EIGRP provides the option of disabling route summarization. The command no auto-summary can be used for this purpose. This option is not available in RIP and IGRP. 8. You can summarize routes in EIGRP at any arbitrary bit boundary. 9. EIGRP uses a distributed algorithm called DUAL when a route fails and has no feasible successor to discover a replacement for a failed route. When a new route is found, DUAL adds it to the routing table. 1. Delay: Calculated by adding up the delay along the path to the next router. 2. Reliability: This is representative of how many errors are occurring on the interface. The best reliability value is 255. A value of 128 represents only 50% reliability. 3. Load: Load metric also has a range from 1 to 255. If a serial link is being operated at 50% capacity, the load value is 255X0.5 or 12.5. Lower load value is better. 4. MTU: Stands for Maximum Transmit Unit size, in bytes. Ethernet and serial interface has a default MTU of 1500. Larger MTU size means that the link is more efficient. 5. Bandwidth: The bandwidth is specified in Kbps. Larger the bandwidth, better the link. This is represents the maximum throughput of a link. 6. MTU (Maximum Transmission Unit): This is the maximum message length that is acceptable to all links on the path. The larger MTU means faster transmission of packets. 7. Reliability: This is a measurement of reliability of a network link. It is assigned by the administrator or can be calculated by using protocol statistics. 8. Delay: This is affected by the band width and queuing delay. 9. Load: Load is based among many things, CPU usage, packets processed per sec. 1. An autonomous system consist of routers, that present a consistent view of the routing to the external world. 4. An autonomous system can run both interior and exterior protocol simultaneously. However, Interior protocols such as RIP, IGRP are used for communication within the autonomous system, and exterior routing protocols such as BGP are used for communication between autonomous systems. EIGRP uses multicasts to send queries to neighbor routers. 1.By default, EIGRP summarizes routes at the major network boundaries (classful boundaries). 2.To enable summarization at any level other than major network boundary, you need to disable auto summarization using the command: "No auto-summary"
4.Note that you need to specify the IP address and routing mask of the summary route. No need to specify the metrics. The command : "ipx router eigrp 10" specifies that eigrp is used for routing protocol, and 10 is the autonomous system number. The command : "network 20" assigns EIGRP for IPX updates to network 20. EIGRP maintains a number of timers and variables containing time intervals. These include an update timer, an invalid timer, a hold-time period, and a flush timer. The update timer specifies how frequently routing update messages should be sent. The EIGRP default for this variable is 90 seconds. The invalid timer specifies how long a router should wait in the absence of routing-update messages about a specific route before declaring that route invalid. The EIGRP default for this variable is three times the update period. The hold-time variable specifies the holddown period. The EIGRP default for this variable is three times the update timer period plus 10 seconds. Finally, the flush timer indicates how much time should pass before a route should be flushed from the routing table. The EIGRP default is seven times the routing update period. show ip eigrp topology: To display entries in the Enhanced Interior Gateway Routing Protocol (EIGRP) topology table, use the show ip eigrp topology command in EXEC mode. P: Passive: means the router is not looking for the route actively, thus it means it is in good situation. The status of "Active" means some instability in network. show ip eigrp neighbors: To display the neighbors discovered by Enhanced Interior Gateway Routing Protocol (EIGRP), use the show ip eigrp neighbors command in EXEC mode. It shows when neighbors become active and inactive. The neighbor parameters displayed include Address, Interface, Holdtime, Uptime, Q, Seq Num, SRTT, and RTO. show ip route eigrp: Displays the EIGRP routes installed in the route table. Displays the current EIGRP entries in the routing table. 1. Neighbor address: This is the network layer address of the neighbor router. 2. Queue: This represents the number of packets waiting in queue to be sent. 3. Smooth Round Trip Time (SRTT): This represents the average time it takes to send and receive packets from a neighbor. This timer is used to determine the retransmit interval (RTO). 4. Hold Time: This is the period of time that a router will wait for a response from a neighbor before considering the link unavailable.